Rokinon 8mm f/2.8 Aspherical UMC Lens For Sony (Silver)! USPS 2-3 days!!!!! 4 product ratings - Rokinon 8mm f/2.8 Aspherical UMC Lens For Sony (Silver)! USPS 2-3 days!!!!! Trending at $162.03Trending price is based on prices over last 90 days. Rokinon 8mm F2.8 UMC Fisheye II (Black) Lens for Fuji X Cameras - New! Rokinon 8mm F2.8 UMC Fisheye II (Black) Lens for Samsung NX Cameras - New! 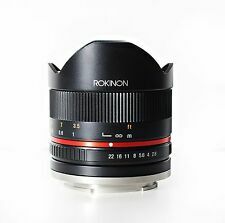 Rokinon 8mm f/2.8 II UMC Fisheye Black Lens Sony E Mount F2.8, Excellent In Box! 4 product ratings - Rokinon 8mm f/2.8 II UMC Fisheye Black Lens Sony E Mount F2.8, Excellent In Box!